Antitrust courts and commentators have long appreciated that joint ventures among rival firms have the potential to provide benefits to consumers and the economy through synergies and economies of scale, but also raise the potential of lessening competition among the venture principals. The case law and academic literature have often ignored, however, the potential harm that befalls consumers when joint ventures with market power are structured in a manner that gives the principals the ability to direct policy and a strategy in a manner that advances their parochial self-interest, rather than the interests of the venture-as-a-whole. The Supreme Court's recent decision in American Needle, Inc. v. NFL properly focused on the difference between a single economic entity (like a corporation) and the typical sports league, which is governed by club owners who act in the interests of their own clubs. 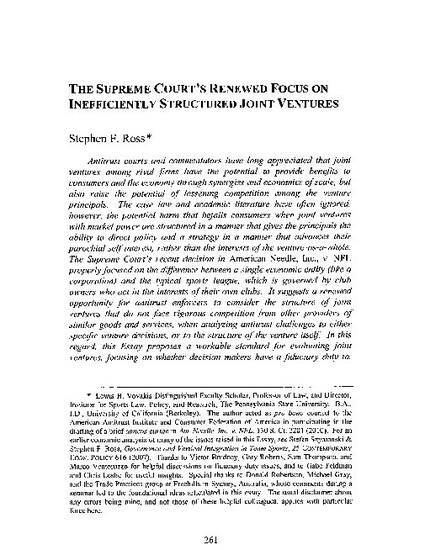 It suggests a renewed opportunity for antitrust enforcers to consider the structure of joint ventures that do not face rigorous competition from other providers of similar goods and services, when analyzing antitrust challenges to either specific venture decisions, or to the structure of the venture itself. In this regard, this essay proposes a workable standard for evaluating joint ventures, focusing on whether decision makers have a fiduciary duty to, and economic incentives aligned with, the profitability of the venture-as-a-whole.